Near the start of Jurassic World, Bryce Dallas Howard’s scientist Clare tells a group of investors that “no-one’s impressed by a dinosaur anymore,” which has led to a decline in tourism and thus a financial loss. The resulting decision, the one that drives the plot of the following movie, is to genetically create a bigger and badder carnivore of the prehistoric kind and parade it as the saving grace of the failing franchise. You have to wonder is those were the exact words from studio heads as they decided to revive the Jurassic Park film series by making it – you guessed it – bigger and badder than ever before. The end results, while perhaps not as destructive as the genetically modified “Indominus Rex”, produce an unusually mixed beast regardless. Right away, Jurassic World is easily the best of the sequels to Steven Spielberg’s 1993 blockbuster Jurassic Park – including Spielberg’s aggressively dull The Lost World: Jurassic Park and Joe Johnson’s campy B-movie Jurassic Park III – but that’s like saying one turd is slightly more solid than the other pieces of crap (apologies for the graphic imagery you now cannot get out of your head). There are a lot of things that do work, but it’s balanced out by just as many things that don’t; either way, it still fails to even come close to the wonder and enthrallment that the first film perfected to a tee. Relocating the action back to Isla Nublar, the dinosaur-infested island from the first film, was a good move as it returns us to the imagination and possibilities that a theme park with dinosaurs could inspire. It’s now pretty much a full-blown theme park, with functioning rides, museums, water shows, shrill corporate tie-ins (there is a building named after Samsung of all things) and even petting zoos for children. It’s a cute concept, but in being so it lacks the exclusivity that the first film provided. Audiences felt privileged to be among the very select few chosen by Dr Hammond to test his ground-breaking theme park; the isolation from the rest of society created a visceral atmosphere that allowed us to take in the awe-inspiring vision of dinosaurs walking the Earth again, as if we had truly stepped in to another world. Now that there are thousands of tourists descending to the Costa Rican island in droves, suddenly by crowding the place it loses some of the magic and doesn’t particularly stand out from other theme parks other than that there are live dinosaurs roaming the place. The dinosaurs, for the most part, have been reduced to endless CG graphics instead of the smart mix of animatronics and early-90s CGI from the first one, and there are instances where the effects from that one – which still hold up very well by today’s standards – look more convincing than the ones made in 2015. Don’t mistake us, it’s good CGI; but the illusion is dampened by the excess and after a while you start thinking more about how long it took the graphic designers to create the dinosaurs rather than the dinosaurs themselves. 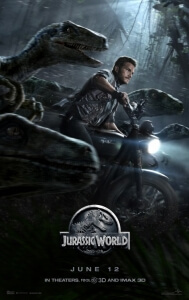 The only part in this movie that actually DOES feel like Jurassic Park again – both in its visuals and sense of enchantment and whimsy – is a scene where Howard’s Clare and Chris Pratt’s Harrison Ford impression raptor-trainer Owen encounter a dying Apatosaurus; it’s a smooth and gentle use of animatronics with barely a hint of recognisable computer imagery, and it’s paced and acted in just the right way that you wonder if Spielberg himself briefly took over from director Colin Trevorrow to just do that scene. Other than that, the frights and sense of wonder is lost in a sea of endless computer graphics which, though impressive, get very tiresome shortly afterward. None of the characters here are particularly memorable either, and some are so much like caricatures that you’re rooting for the carnivorous beasts to munch on them already. Pratt lacks his usual charisma as the straight-faced butch hero archetype, while Howard struggles with a very confusedly-written female lead who despite her high status and supposed high mind for science and business is soon degraded to a dressed-down stick figure that runs in high heels and falls prey to a male character’s charms (on that subject, there’s an uncomfortable level of 90s-era sexism too; most if not all the women characters are portrayed as shrewd, overly-emotional creatures, ironic since all the dinosaurs are bred as female). The villain, too, is as basic as you can get, right down to the three crucial facts that he’s a hulking figure in a suit, he has facial hair, and he’s played by Vincent D’Onofrio. His plan that involves using the raptors as military-grade weapons doesn’t make a lick of sense, though we suppose it could be worse – at least they didn’t use that stupid human-raptor hybrid idea from an earlier script draft. Overall, it’s just a dumb summer blockbuster that doesn’t even succeed in being fun but just plain dumb. It’s far from the worst Jurassic Park film, and we’ve stated that it’s the best out of the sequels to date, but when you compare it to the original it just doesn’t hold water. Even on its own it’s still mediocre, and that’s perhaps the biggest disappointment of Jurassic World – when they say “no-one’s impressed by a dinosaur anymore”, they kind of have a point. Jurassic World is the best of the sequels to Jurassic Park, but flounders heavily in comparison to Steven Spielberg’s game-changing blockbuster as it lacks the wonder, visual spectacle and even the interest to make it work. Some parts work fine, but there are just as many that don’t; it’s just a great big prehistoric disappointment.